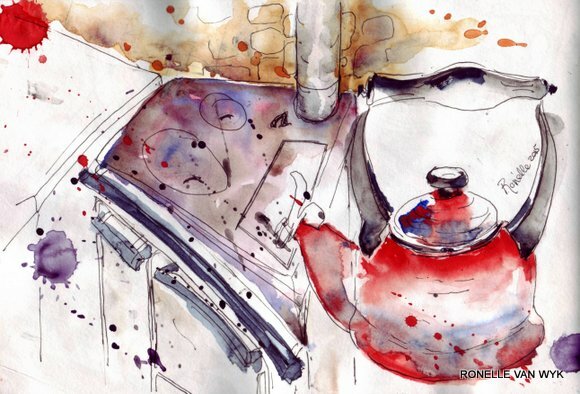 by Myfrenchkitchen.In aquarelle, art, Coin perdu, everyday in May sketching, expressionism, interior sketching, sketching, Stillman & Birn sketchbook.6 Comments on EDM art 5: A hot woodburning stove. You picked a challenging angle–that is, it would challenge me, Ronelle. But how warm the scene is–a hot kettle on a glowing stove. I just love it. A keeper, for sure. can you not get another thermostat for it? You’ve just made a very humble item a glorious thing. Beautiful. Previous Previous post: EDM-art 4: Spice bottles.